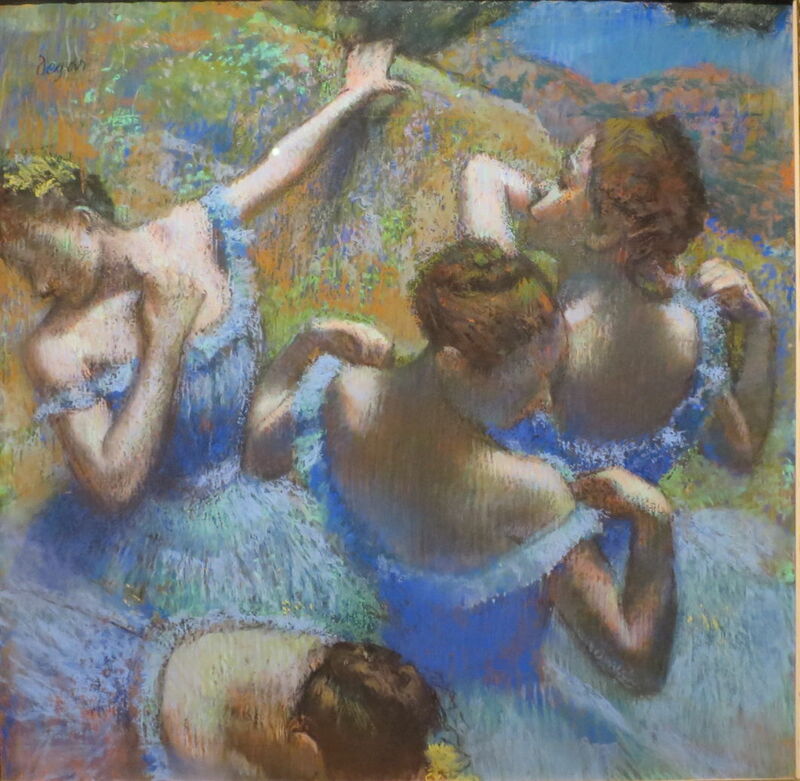 Edgar Degas (1834–1917), Dancers in Blue (date not known), pastel, dimensions not known, Puschkin Museum of Fine Arts, Moscow, Russia. Wikimedia Commons. 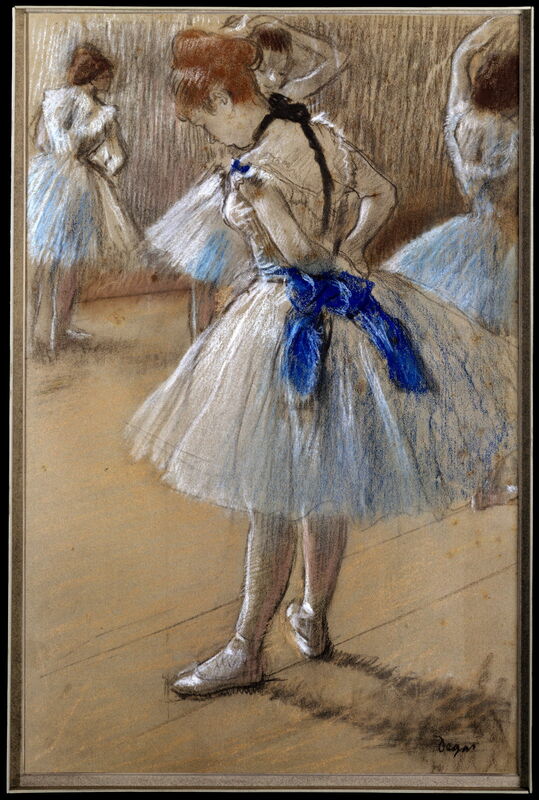 About half of Edgar Degas’ lifetime output is of drawings and paintings of the ballet and its dancers. This overwhelming obsession with dance did not develop until the late 1870s, but dominated his work through the 1880s and on into some of his last paintings. As I have shown, Degas was the first painter to devote any real attention to the ballet, and inspired others to do the same. Edgar Degas (1834–1917), Portrait of Mlle Fiocre in the Ballet ‘La Source’ (c 1867-68), oil on canvas, Brooklyn Museum, New York, NY. Wikimedia Commons. 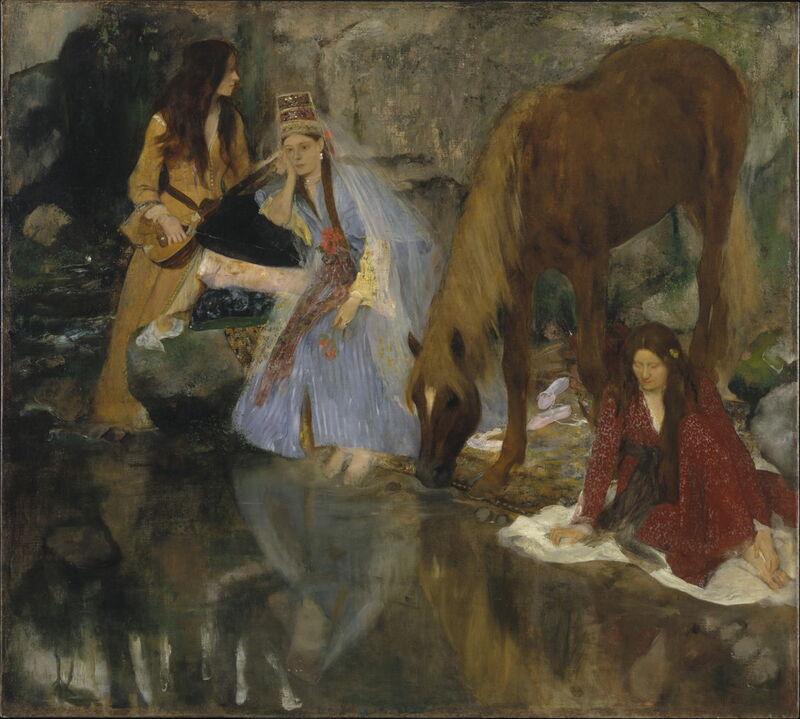 The theme of the ballet first appeared in Degas’ Portrait of Mlle Fiocre in the Ballet ‘La Source’, which he painted in about 1867-68. This complex cross-genre work was a product of the artist’s intention to paint ‘modern life’, and his previous history painting. The ballet La Source (The Spring) was composed by Delibes and Minkus, with choreography by Arthur Saint-Léon, and received its world première at the ballet of the Paris Opera on 12 November 1866. Principal roles were Eugénie Fiocre, the subject of Degas’ painting, Guglielmina Salvioni, and Louis Mérante. The première was a major event, with Ingres and Giuseppe Verdi attending a preview dress rehearsal, although the production didn’t turn out to be particularly successful. Degas’ painting is also something of a puzzle, as it shows the principal dancer in a static role during the first act, where she rests with her retinue (being the Princess Nouredda) and a horse by a mountain stream. 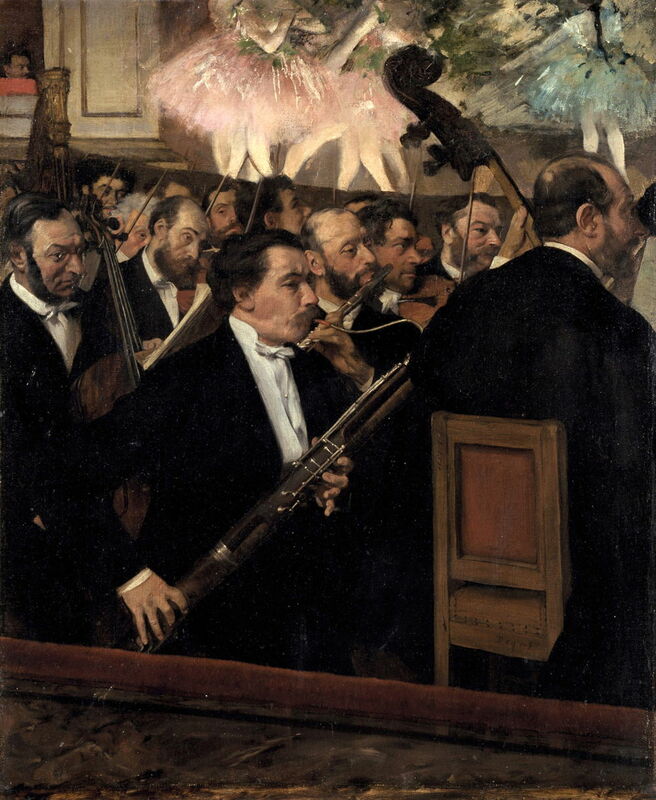 Edgar Degas (1834–1917), The Orchestra at the Opera (c 1870), oil on canvas, 56.5 × 45 cm, Musée d’Orsay, Paris. Wikimedia Commons. Degas next seems to have touched on the subject of ballet when painting a friend of his, Désiré Dihau, who played the bassoon in The Orchestra at the Opera. This may have been painted as early as 1868, or around 1870, and was one of a series of views of the fourteen-strong orchestra as if seen from the audience. Each shows a tantalisingly highlighted stage with dancers, a lead which Degas followed. 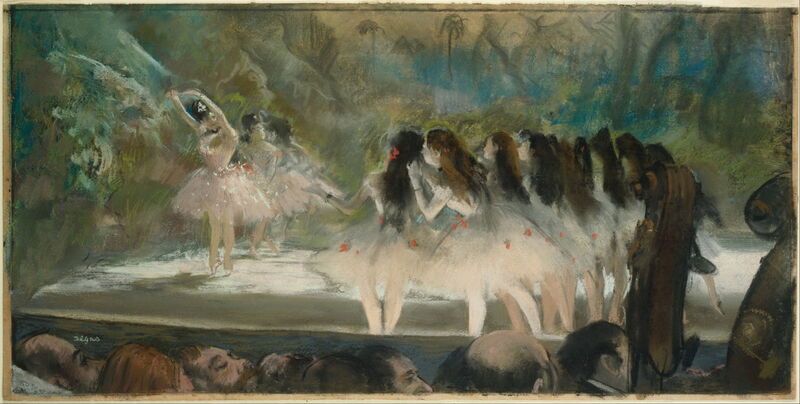 Edgar Degas (1834–1917), Ballet at the Paris Opéra (1877), pastel over monotype on cream laid paper, 35.2 x 70.6 cm, Art Institute of Chicago, Chicago, IL. Wikimedia Commons. In his pastel painted over a monotype of the Ballet at the Paris Opéra (1877), Degas is making the move from the audience and musicians to the stage and its dancers. From the 1870s, Degas painted a succession of works showing every imaginable aspect of the ballet of the Paris Opera and its dancers. These tend to fall into two main groups: works concentrating on individual dancers and small groups, which I examine in this article, and more complex compositions featuring more dancers and various activities, which I will cover in the next. 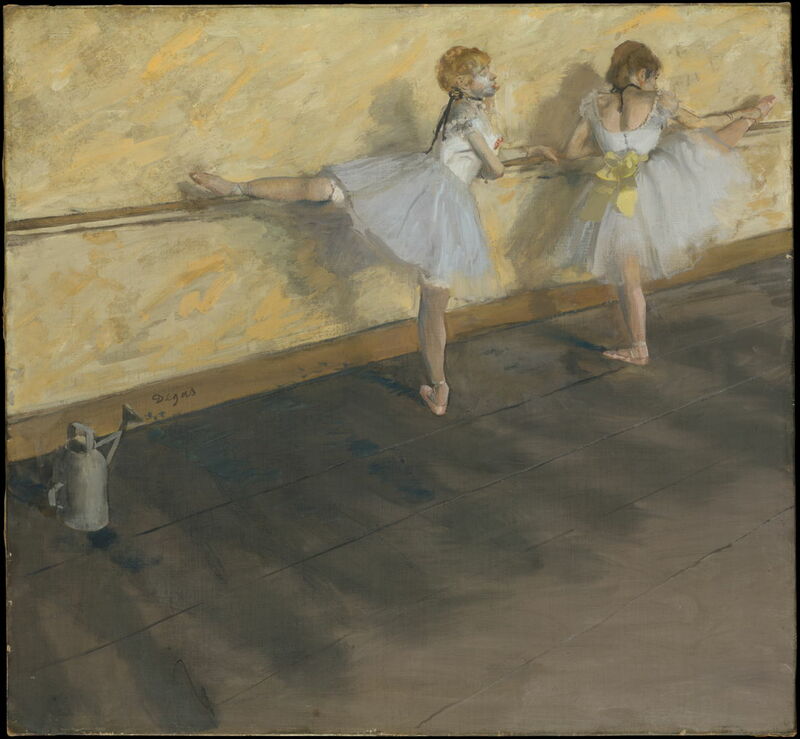 Edgar Degas (1834–1917), Dancers Practising at the Barre (1877), mixed media on canvas, 75.6 × 81.3 cm, Metropolitan Museum of Art, New York, NY. Wikimedia Commons. Dancers Practising at the Barre, from 1877, is a bridge between these two groups, in showing two dancers in a training context. Degas’ attention is divided between their form, and a more expansive composition including props like the watering can. Edgar Degas (1834–1917), Dancer Posing for a Photographer (Dancer in Front of the Window) (1873-75), oil on canvas, 65 × 50 cm, Puschkin Museum of Fine Arts, Moscow, Russia. Wikimedia Commons. Dancer Posing for a Photographer (Dancer in Front of the Window) from 1873-75 is one of Degas’ earlier portraits of an individual dancer, made when she was posing alone for a photograph. With the long exposures required when taking photos indoors at that time, she would have held this pose for some time, and it appears a static version of what should have been a dynamic performance. It reveals Degas’ principal interests in these images: form, and the apparent disembodiment resulting from the dancer’s dress. Danseuse basculant (Danseuse verte) (Swaying Dancer, Dancer in Green) (1877-79) develops those themes using an unusual combination of pastel and gouache. In the foreground of his innovative overhead view, dancers in green are in motion. There is a complete disembodiment, which is enhanced by his tight cropping to include the head and shoulders of just one of several dancers. Legs appear almost randomly from the nebulous dresses. Behind them is a rhythmic repetition of dancers in orange dresses, sufficiently similar as to suggest that they might be multiple images of the same figure, but sufficiently different in hair colour to show that they are not, quite. 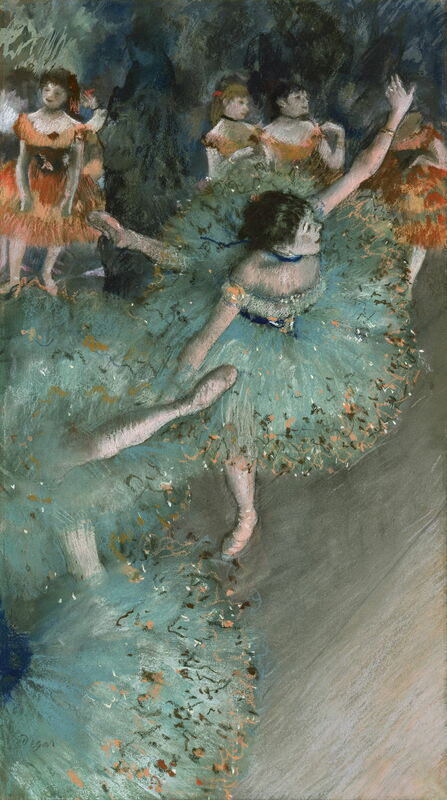 Degas’ interest in the form of the dancers included representing that form in motion. Another painting in a combination of gouache and pastel, The Star: Dancer in Pointe, from about 1878-80, shows his pioneering attempts to ‘freeze frame’ a dancer in motion, as he had done earlier with horses racing. These paintings were not just at the leading edge of art, but Degas was tracking technological innovation. It was during the 1870s that Eadweard Muybridge and Étienne-Jules Marey started making serial photographic images of horses and humans in motion, and their images must have inspired Degas’ imagination and his art. Edgar Degas (1834–1917), Dancer (study) (c 1880), pastel and charcoal on blue-gray wove paper, 48.9 x 31.8 cm, Metropolitan Museum of Art, New York, NY. Wikimedia Commons. 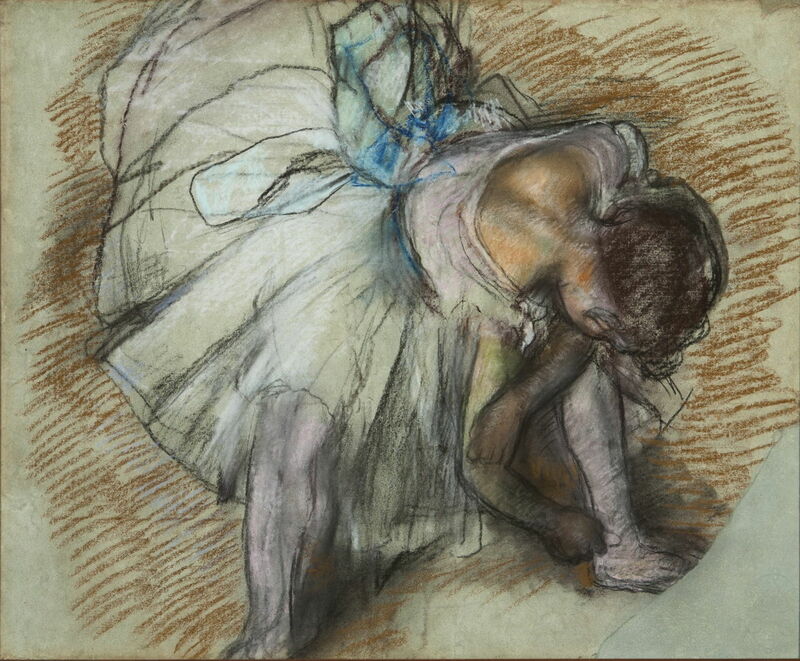 Degas’ studies and sketches, such as Dancer made in pastel and charcoal in about 1880, show his enduring emphasis on form. 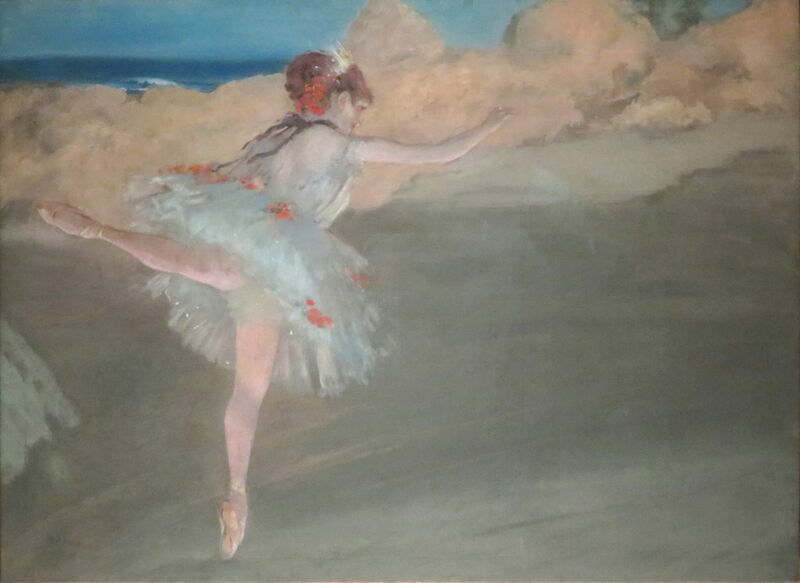 Edgar Degas (1834–1917), Ballet – The Star (Rosita Mauri) (date not known), pastel, 58 × 42 cm, Musée d’Orsay, Paris. Wikimedia Commons. Among Degas’ paintings and drawings are many showing the great dancers of the day: Ballet – The Star shows the prima ballerina Roseta Mauri (1850-1923), who joined the Paris Opera in 1878, and was painted by Édouard Manet, Renoir, Léon Bonnat, Anders Zorn, and Degas’ friend Ludovic-Napoléon Lepic, and who was photographed on numerous occasions by Nadar (in whose studio the First Impressionist Exhibition was held). 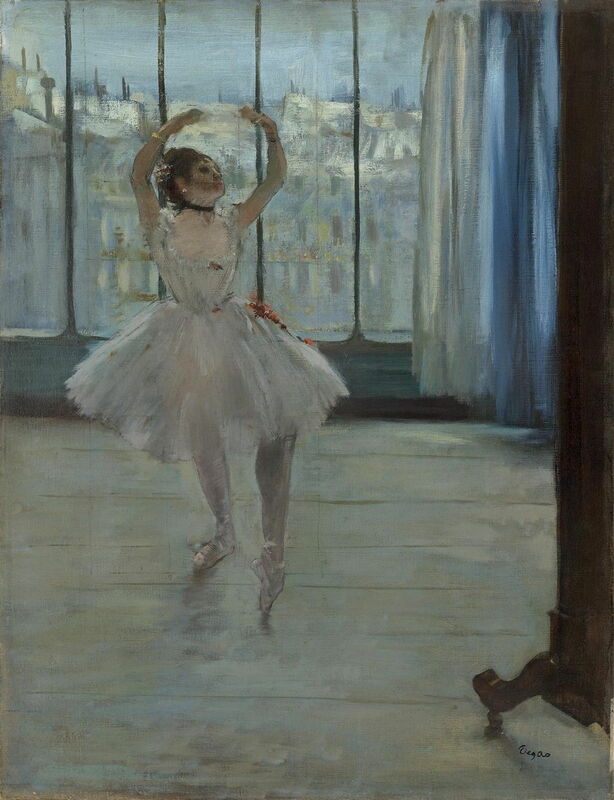 It was Degas, though, who painted her in motion during a ballet. Dancers in Blue is a brilliant pastel painting which shows rhythmic repetition of nearly identical dancers, as if they were superimposed images in one of Muybridge’s or Marey’s photographic studies. With his classical training as a draughtsman, Degas was constantly exploring the human form – also a dominant theme in his paintings of women bathing and at their toilet. Among his most persistently favoured poses is seated, bending forward to place a hand on or near a foot. 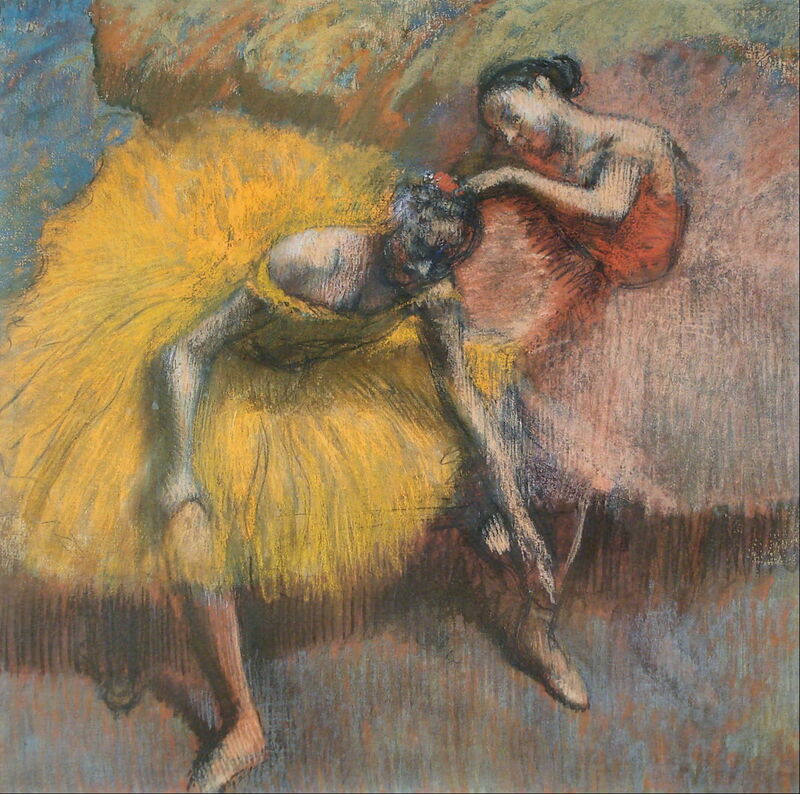 Edgar Degas (1834–1917), Bowing Dancers (1885), pastel, 36 × 49 cm, Private collection. Wikimedia Commons. 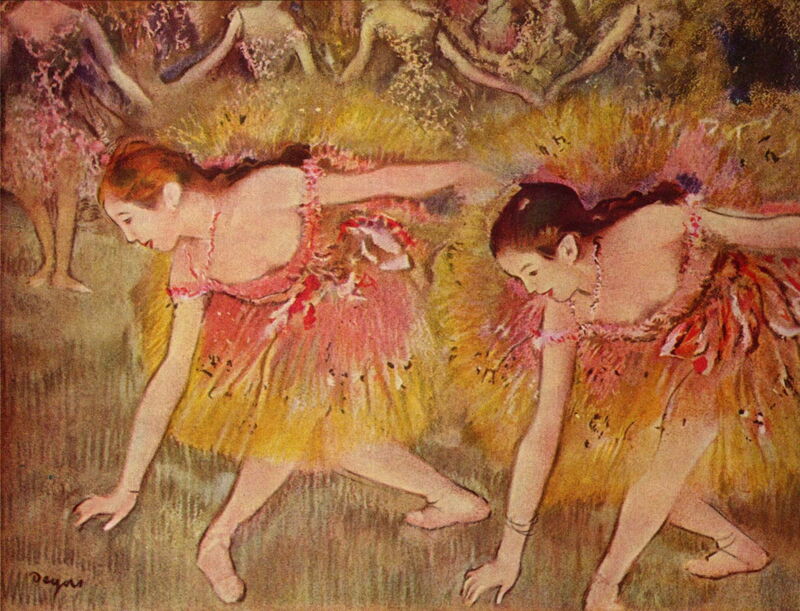 In Bowing Dancers, a pastel painting from 1885, Degas shows two dancers taking a bow at the end of a performance, with the corps de ballet, their hands linked, behind them. This combines the action of bending forward, in the standard manner used by dancers, with echoed form. Edgar Degas (1834–1917), Dancer (1881-83), pastel, 62 × 49 cm, Musée d’Orsay, Paris. Wikimedia Commons. 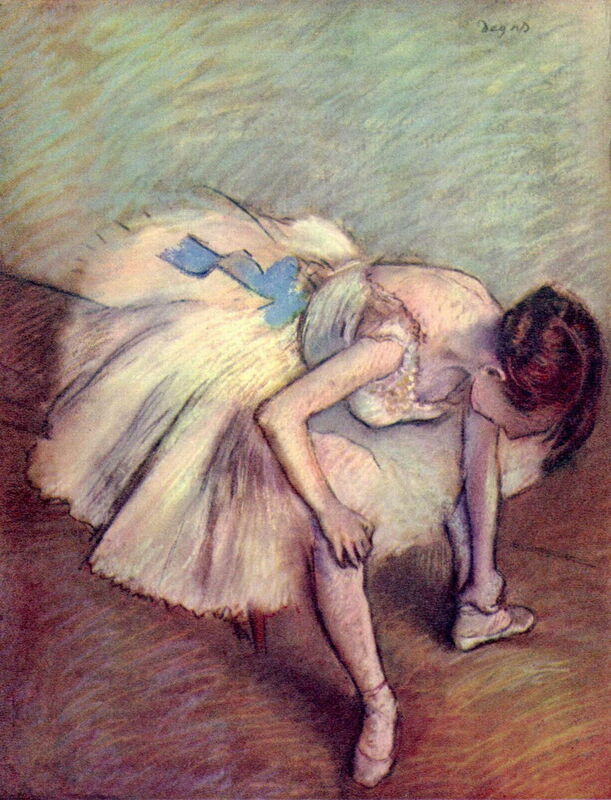 A slightly earlier pastel from 1881-83, known simply as Dancer, shows a dancer reaching down to her left ankle, much in the way that Degas used in Waiting, from the same period. Edgar Degas (1834–1917), Dancer Adjusting Her Shoe (1885), media not known, 47.6 x 59.7 cm, Dixon Gallery and Garden, Memphis, TN. Wikimedia Commons. Dancer Adjusting Her Shoe (1885) is a study of a slightly more complex pose, the dancer adjusting her left shoe with her right arm, and her left hand in the crook of her right elbow. This brings her head, arms, and left leg into a very unusual and compact structure, which appears quite separate from her splayed right leg. Edgar Degas (1834–1917), Dancer Fastening Her Shoe (c 1893-98), oil colour and turpentine, 70 × 200 cm, Cleveland Museum of Art, Cleveland, OH. Wikimedia Commons. Most remarkable of all is his composite work, made using peinture à l’essence, of a Dancer Fastening Her Shoe (c 1893-98). This brings together four different views of the same dancer fastening her left shoe, in a manner which must have been inspired by Muybridge and Marey’s composite photos, and may well have reflected his own experiments in photography. Edgar Degas (1834–1917), Two Dancers in Yellow and Pink (c 1898), media and dimensions not known, Museo Nacional de Bellas Artes, Buenos Aires, Argentina. Wikimedia Commons. Degas also explored other themes and concepts in these paintings, even when his eyesight and health were failing in his old age. Two Dancers in Yellow and Pink from about 1898 is one of his highly textured pastel paintings which uses rich colours. One of the dancers is bending forward, and her disembodied legs seem to be in union with her arms. This marks nearly thirty years of constant innovation in these brilliant paintings. 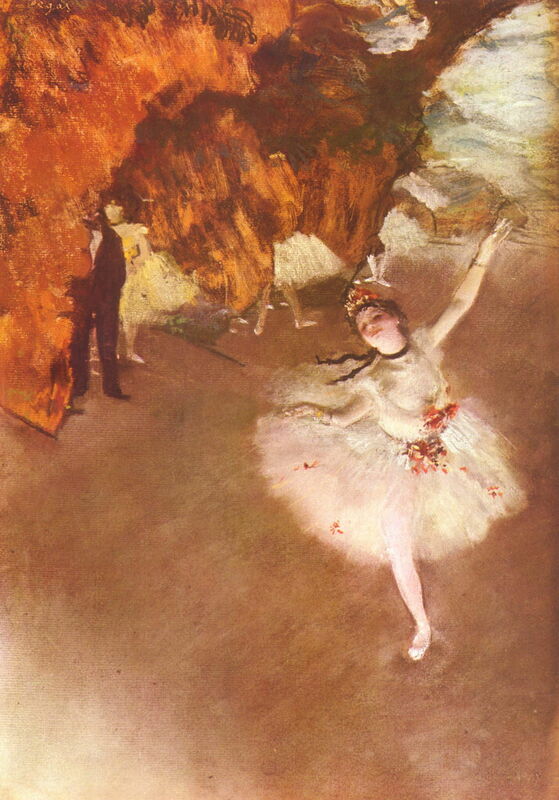 In the next article, I will look at Degas’ more complex compositions of dancers and ballet. Posted in General, Life, Painting and tagged ballet, dancer, Degas, Marey, Mauri, Muybridge, Nadar, painting, pastel. Bookmark the permalink.